My ex-girlfriend—who lives in Roncesvalles—was flipping through the photographs for this project. I guess we’re still friends, after a fashion. But sometimes it can be rocky. Dundas West station. Or a McDonald’s restaurant? “That’s a bit harsh,” I replied. “This is a complete misrepresentation of Dundas West, of what passengers truly experience. You’ve fetishized detachment and emptiness, but where’s the human element? The animating spirit?” she asked. Perhaps she has a point. My intent, with every gallery, is to convey the instantiated station design (whether positive or not, remarkable or non-descript). People are visual clutter. But it’s fair to argue that our assessment of a public space must be informed by an awareness of how people use, interact and move through it—we mustn’t forget its prime functional purpose, after all. Below ground, Dundas West is a grey warren. It lacks concinnity. 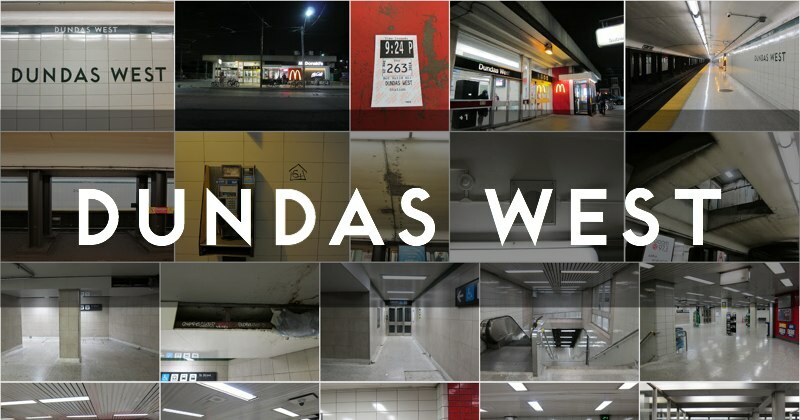 Dundas West is the third subway station to be built on Dundas Street (though one can make a plausible case that Kipling also serves Dundas). It was originally named Vincent—after a small local street erased by the adjacent Crossways apartment complex, and also the name of the loop which had been the western end of the King streetcar line—but the TTC decided to begin its convention of ‘Street-name West’ (a practice it had avoided with the University line stations). The Vincent designation was instead applied to the subway yard constructed immediately south-west of the station. Dundas West opened on February 25, 1966 as part of the Bloor-Danforth line. At the time of writing, it still lacked a direct connection to the Bloor GO transit / UP Express platforms, due to decades-long squabbling between the TTC, GO/Metrolinx, and the Crossways owners (Update: On Sept. 1, 2017 Metrolinx filed to expropriate the section of property needed to proceed with the link).